I had the great fortune to enjoy a random visit with Erin the other day while awaiting the 4-H guy to show up at the SOCC. Erin and Hig’s interest in “extreme exploration” intrigues me! 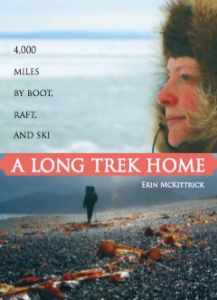 Not just the fact that they are out there, on their own, in the elements – and seriously – many times FAR from any kind of assistance or comforts that we take for granted – but I seem to settle in on the fear of the lack of warmth – and I get stuck there. I’ve only been in Alaska for 18 years, and I was imported from Hawaii – so my tolerance of the cold is, well, big time wimpy! The beauty is, that if you have the right equipment and clothing, being out in the elements can be amazingly wonderful, beautiful, quiet and inspiring. But the next challenge – besides staying warm, when I consider their grand adventures – is the ability to keep the kids happy, warm (I know – there it is again), and managing the demanding eating/sleeping schedules of young children! Like I said, Erin and Hig are inspirational – as these things I mentioned above – well, the management of them all just comes naturally to them. 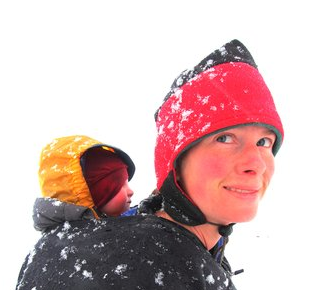 As I ride out the road to show property, or visit a friend, or pick up someone at Jakolof Dock, I often see Erin or Hig on their bikes with Katmai and Lituya in their trailers making the trek to and from town – winter or summer, rain or sun! 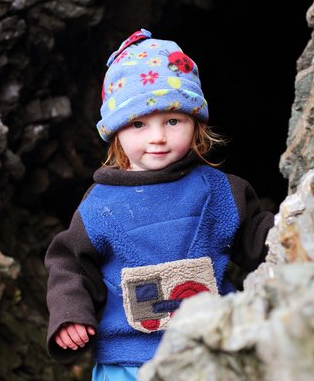 The children have grown up with this wanderlust and appreciation for the outdoors – and I can’t think of a greater gift a parent can give to their child is a love for the outdoors,travel and adventure – and to enjoy time together as a family. This, it appears, is all under control. They are making (and recording) memories that will last a lifetime. Recently, Hig and Erin’s 4,000 mile trek from Seattle to the Aleutians was shared with the world: Journey on the Wild Coast was shown on PBS which is a compilation of the footage taken during their trip! The book A Long Walk Home is the written version of their experience and is also available on their site. 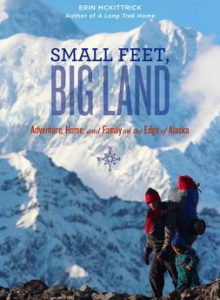 Also – keep an eye out for Erin’s newest book – coming out in October 2013, Small Feet, Big Land, about life in Alaska, their adventures as a family living in Seldovia and their treks around the state with Katmai and Lituya! 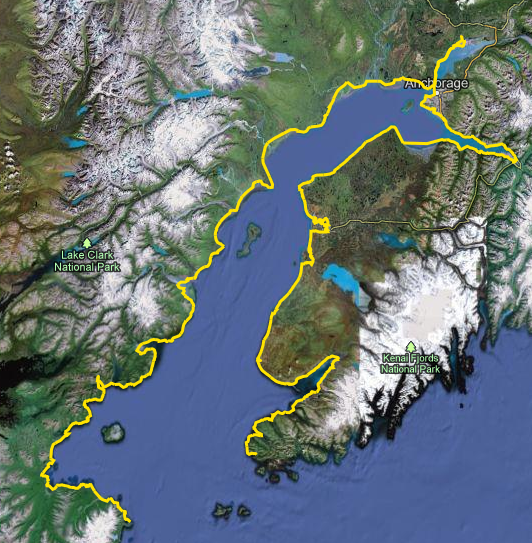 Regarding this upcoming trip – Tracing the Heart of Alaska – A Journey Around Cook Inlet, their plans are to leave Wednesday, March 27, 2013 – on the Laura S. out of Seldovia to be dropped off in Dogfish Bay to begin the hike. 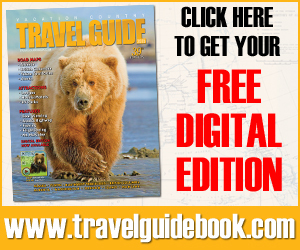 There are so many trips this young couple, and now, family have taken – that you should certainly check out their website to read more – see beautiful photos and be able to vicariously enjoy this great adventure coming up touring Cook Inlet. There are opportunities to catch up with them, connect via email, phone, Facebook, etc. and even offer support financially or with housing when they walk through your community. You can click on the map below to go directly to Hig and Erin’s site: GroundTruthTrekking.org to catch up on all the details, see more photos of their exciting adventures, both past and present! Their website is so full of information regarding their trips, their philosophy, and many photos of the most amazing places – most of us will never go! ATTENTION SELDOVIANS: Hig, Erin, Katmai and Lituya plan to camp the night at Outside Beach (most likely on the 2nd now since the weather may be pushing them back a day) and would love for you to stop by to say hello and visit by the fire that evening – or come by to send them on their way towards Barabara Point in the morning! 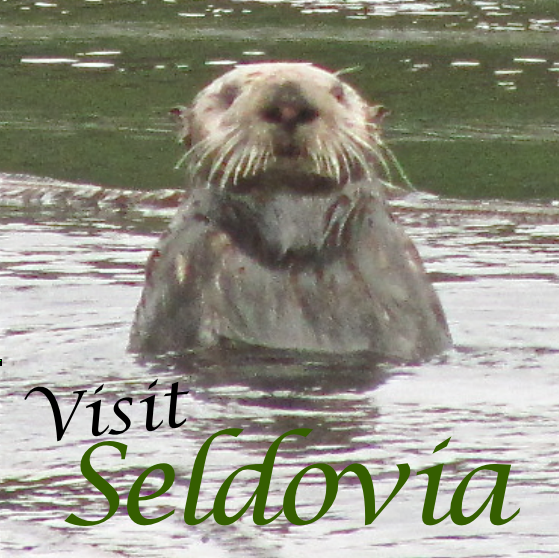 Stay tuned for further information as to the exact date of their arrival in Seldovia! Check out their rough schedule below for an expected itinerary. Obviously this schedule is subject to all kinds of changes, as weather and children are not always (seldom) predictable! As of the posting of this article – weather will most likely set this whole schedule back 1-2 days. Click here to go to their website for updated schedule! And you know what I personally find super fantastic? Through their books, movies, Facebook and blogging, we can enjoy this exploration too, without the cold – from the comfort of our living rooms! Thanks Erin and Hig for sharing this amazing experience with all of us! We wish you safe, happy and warm travels! In the Media… Ground Truth Trekking Makes Headlines! « Bilingual School Student in California Looking for Alaska Information – Will you help?